November 30, 2012 | David S. Maldow, Esq. Vidtel, known for its cutting edge, any-to-any cloud videoconferencing services, has just announced that they are rolling out WebRTC support for their platform. WebRTC is a technology which enables inherent videoconferencing within internet browsers. Many common VC solutions require users to install and run a client on their computer (think of how Skype works on your home PC). With WebRTC, no separate app is required, the videoconferencing session just appears within a browser window, just like any other basic website element. Cloud videoconferencing has been riding a wave of positive buzz in the videoconferencing industry. An interesting element of the cloud revolution is the fact that new companies, small "attackers and disrupters," have been able to break into the videoconferencing industry, which was previously locked up among a small handful of vendors. The traditional vendors are, as a result, scrambling to "cloudwash their software." The new market entries are often fueled by aggressive innovation and product development. One such company is Vidtel, notable for its leadership position in providing B2C videoconferencing interoperability, as well as its full line of cloud-based video support services. For example, their MeetMe service allows multiple participants to connect to a cloud based meeting room, via a choice of professional and consumer options, including H.323, SIP, Skype, Google Talk, Jabber, and others. This latest development expands upon their existing capability by allowing connections from any standard browser. WebRTC is exciting for a number of reasons. Many enterprises have policies which prohibit the installation of consumer clients on workplace devices. With WebRTC there is no installation, registration or plug-ins. If you can browse to a website, you can participate in a WebRTC video meeting. Many users, even if permitted to install clients on their computers, may be hesitant to do so. We have all felt like we just have too much "stuff" running in the background, and possibly effecting our computer performance. If you present users with a popup, asking them for permission to install your client, you are giving them an opportunity to say "No." Vidtel is not the first out of the gate with WebRTC capability, but they claim that their implementation is particularly clean, whereas some of their competitors still require some form of plug-in. I asked Vidtel for more details and they told me that their use of WebRTC is unique in that it is native and standards-based. Furthermore, they believe they are the only company with a true WebRTC gateway to H.264 (other approaches are proprietary and only use parts of the WebRTC, which means they require a plug-in to work). I went to Vidtel's new WebRTC site myself to see for myself, and I was not asked for any plug-in, download, or login. My browser gave me the choice of whether or not to allow the site to access my webcam (see below) and that was it. After allowing camera access, I just typed the room number, presses "call", and I was in the meeting, right in that very same browser window. Another notable dynamic of the WebRTC structure is that no registration is required. We have all reached the point where we are extremely hesitant to sign up for yet another service, give our email to yet another vendor, and have to remember yet another password. 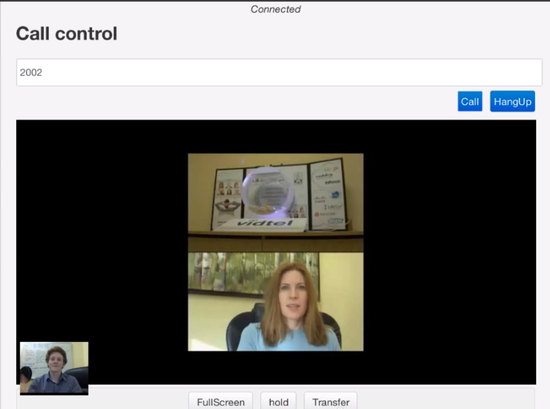 With WebRTC you can join a meeting anonymously, with no sign up. This may be but a small barrier to the future of ubiquitous videoconferencing, but every barrier eliminated is a victory. I am not the only one impressed with what Vidtel has done here. Yesterday, they won the WebRTC Demo Award for Best Conferencing at the WebRTC Conference and Expo. I spoke with Vidtel Co-Founder and VP of Marketing, Mariette Johnson Wharton, and she had this to say about winning the award, "We are honored to be recognized by WebRTC Expo for the Best Conferencing Award - a lot of innovative companies are here. People are very interested in our ability to seamlessly connect enterprise systems with the browser without any plugins." Vidtel is 100% channel focused and is strongly committed to supporting and growing their partnerships. Vidtel does not aggressively market direct services for the enterprise, which would put them in competition with the existing VC sales channel. Instead, Vidtel propositions itself themselves as both a value add for its partners' portfolios, as well as a way to encourage greater adoption of videoconferencing, which will result in additional VC equipment and service sales for the channel. The videoconferencing industry has been battling a long list of adoption barriers since its inception. Removing the need to install a client eliminates a significant, and longstanding, barrier, but it is not the end of the story. I don't expect this to, in and of itself, answer all of the longstanding problems in the VC world. However, I think we may be surprised at how quickly users take to it. In the limited testing I have done with browser based solutions, I found that it seems to resonate quickly with the casual user. I hope that in few months Vidtel will be able to share some eye opening adoption results to prove me right. 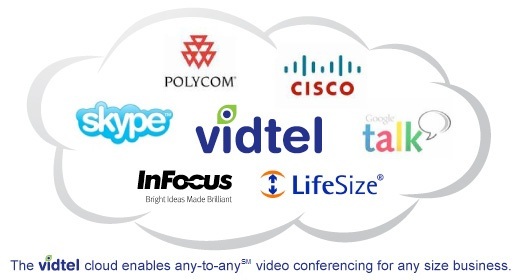 \n\nVidtel, known for its cutting edge, any-to-any cloud videoconferencing services, has just announced that they are rolling out WebRTC support for their platform. WebRTC is a technology which enables inherent videoconferencing within internet browsers. Many common VC solutions require users to install and run a client on their computer (think of how Skype works on your home PC). With WebRTC, no separate app is required, the videoconferencing session just appears within a browser window, just like any other basic website element. \n\nCloud videoconferencing has been riding a wave of positive buzz in the videoconferencing industry. An interesting element of the cloud revolution is the fact that new companies, small \"attackers and disrupters,\" have been able to break into the videoconferencing industry, which was previously locked up among a small handful of vendors. The traditional vendors are, as a result, scrambling to \"cloudwash their software.\"
\n\nThe new market entries are often fueled by aggressive innovation and product development. One such company is Vidtel, notable for its leadership position in providing B2C videoconferencing interoperability, as well as its full line of cloud-based video support services. For example, their MeetMe service allows multiple participants to connect to a cloud based meeting room, via a choice of professional and consumer options, including H.323, SIP, Skype, Google Talk, Jabber, and others. This latest development expands upon their existing capability by allowing connections from any standard browser. Vidtel is not the first out of the gate with WebRTC capability, but they claim that their implementation is particularly clean, whereas some of their competitors still require some form of plug-in. I asked Vidtel for more details and they told me that their use of WebRTC is unique in that it is native and standards-based. Furthermore, they believe they are the only company with a true WebRTC gateway to H.264 (other approaches are proprietary and only use parts of the WebRTC, which means they require a plug-in to work). I went to Vidtel's new WebRTC site myself to see for myself, and I was not asked for any plug-in, download, or login. My browser gave me the choice of whether or not to allow the site to access my webcam (see below) and that was it. After allowing camera access, I just typed the room number, presses \"call\", and I was in the meeting, right in that very same browser window. \n\n \n\nAnother notable dynamic of the WebRTC structure is that no registration is required. We have all reached the point where we are extremely hesitant to sign up for yet another service, give our email to yet another vendor, and have to remember yet another password. With WebRTC you can join a meeting anonymously, with no sign up. This may be but a small barrier to the future of ubiquitous videoconferencing, but every barrier eliminated is a victory.